Stunning views of Kalkan and Kalamar Bay, stylish modern interiors and a large private swimming pool: welcome to four-bedroomed Villa Rumi on Turkey's Mediterranean coast. Stunning views of Kalkan and Kalamar Bay, stylish modern interiors and a large private swimming pool: welcome to four-bedroomed Villa Rumi on Turkey's Mediterranean coast. The luxury family and group-friendly villa sleeps up to eight across its two spacious floors and boasts an excellent location in the hillside, overlooking Mouse and Snake Islands from the balconies and sun terrace. The villa's design is immaculate with clean lines and large spaces. Think white-washed walls and natural-coloured furnishings. 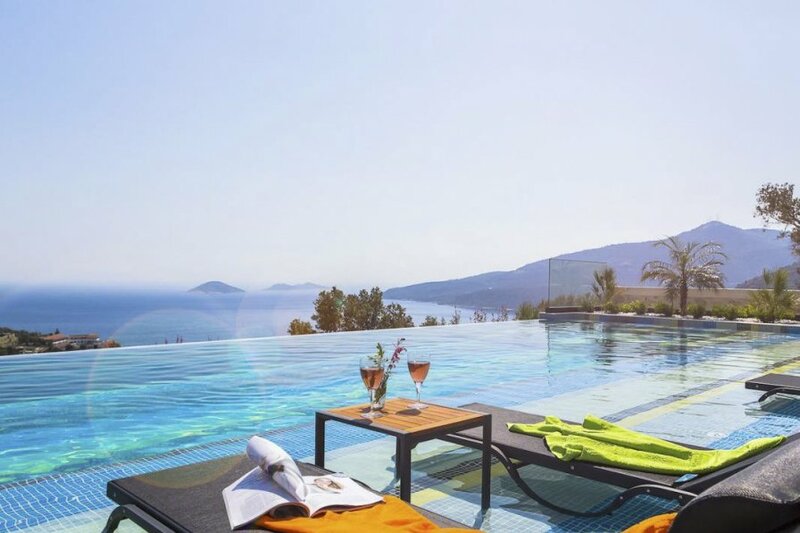 The sun lounger-lined infinity pool is set on the crest of a pine-tree-graced hill, with breath-taking views of the mountainside and Kalkan town in the distance. The swimming pool has an area into which sun loungers can be placed – ideal for transitioning from sunbathing to cooling dip – as well as a separate section for kids and a Jacuzzi. The pool terrace is furnished with an al fresco dining table too and a shaded seating area to enjoy those stunning views. Inside, the contemporary style and luxurious comfort continue. The modern open-plan living and kitchen is well-equipped and includes appliances such as a large fridge-freezer, oven and microwave. It also a charming dining table, seating up to nine. The living area has plenty of comfortable seating, flat-screen television and direct access to the pool terrace. A separate toilet is located on this level, together with a utility area housing a washing machine, iron and ironing board for a homely touch. The first of the villa's four bedrooms, a double, is on this floor and this bedroom has an en-suite shower room together with direct access out onto the pool terrace too. On the first floor, there are two double rooms – each en-suite shower room and sea view balcony – plus a twin room – with en-suite shower room and sea-view balcony. When you can bring yourself to leave this haven, the vibrant centre of Kalkan with its famous rooftop bars and restaurants is a 20-minute walk away. -Open plan fully equipped kitchen, living and dining area. -Utility room, with a washing machine, iron and ironing board. -Double bedroom, en-suite shower room, access to pool terrace. Villa Rumi is ideally placed in the centre of Kalkan, overlooking the bay, the town itself and the glistening turquoise coastline. The old fishing town, turned vibrant holiday destination, is a treasure trove of narrow streets, whitewashed houses and inviting boutiques. It's also famous for its local bazaars (markets) selling everything from handmade rugs to fresh produce, harbourside bars and rooftop restaurants serving a variety of delicious cuisine. Look out for Turkish specialities like gozleme (thin dough crepes) with cheese and spinach fillings or hearty meat and seafood mezes. For days spent relaxing on the sands or swimming in the sea, the villa is within a short drive or bus ride (Dolmus) from Kaputas Beach with crystal-clear waters and Patara Beach, a 12-mile long stretch of shoreline that's also a National Park. Both have day beach clubs as well as calm waters that are ideal for swimming. There's also the opportunity to take part in water sports like sea kayaking, parasailing and scuba diving, or jump on a traditional wooden gullet for a trip around the bays. By boat, you can also visit the small island of Kekova where you can snorkel and explore the part-sunken ruins of Dolchiste, an ancient town which was destroyed by an earthquake during the 2nd century. You can get there via glass-bottomed boat from Kas, a 30-minute drive from Kalkan. Lively Kas also has the impressive site of ancient Antiphellos, with still-visible ruins including a theatre. For more fun day trips, you could head to the seaside resort town of Fethiye, a one-hour drive away. It has plenty of top-notch restaurants, shops and fascinating cultural sites that are well worth a visit.